Have you ever forgotten to take your medication? Or, have you stopped a course of antibiotics early because you already felt better? If yes, you are not alone. With up to 50 percent of people not taking their drugs as prescribed, medication adherence has been a huge challenge for the U.S. healthcare system. A lot of effort has gone into innovating ways to improve our compliance, with several digital and low-tech solutions already on the market. Pill boxes, text messages, and bottles equipped with a chip are all being used as potential strategies to improve pharmaceutical adherence. However, these innovative approaches have yet to provide compelling, validated evidence that a person has indeed swallowed their medicine. The arrival of a “smart pill” that is embedded with a sensor now offers a novel way of tracking drug compliance. This new health technology has received a lot of scientific and media attention, as well as reactions from the public. Will a pill that can send information from the bloodstream (or digestive tract) support our health in a new way? And, are there any considerations surrounding these new digital pills that should be explored before embracing this new technology? In November 2017, the U.S. Food and Drug Administration (FDA) approved the first drug that has a digital ingestion tracking system. The approved pill is manufactured by Otsuka Pharmaceutical Co. Since July 2012, Otsuka has been working with California company Proteus Digital Health to embed their existing antipsychotic drug Abilify (brand name for aripiprazole) with an ingestible event marker (IEM) sensor. The new product, Abilify MyCite, can detect if the medication has been taken. The attached sensor—made of copper, magnesium, and silicon—is designed to send an electrical signal to an external receiver once the pill mixes with stomach fluid. The receiver (currently a patch) is worn on the left rib cage. The patch communicates with a smartphone app via Bluetooth and provides information on the date and time the medicine was taken. This information can then be forwarded to a group of selected people (up to four) based on user permission. The much-anticipated digital pill is expected to roll out in 2018 and is likely to be followed by other products in the digital drug niche. Technology developed by Proteus has been applied to other areas of medicine, too. The ingestible sensor (independent of any drug) received FDA approval already in 2012. It has since been used to design sensor-enabled drugs for uncontrolled hypertension and type 2 diabetes. Plans to measure adherence in people with Alzheimer’s disease, hepatitis C and those recently discharged from hospitals has also been documented. Abilify MyCite is, therefore, only the latest member of the Proteus’ family of digital pills. In fact, the FDA’s choice of their first approved digital pill has surprised some experts. Abilify is a drug used in the treatment of certain psychiatric conditions, including schizophrenia, bipolar disorder, and depression. Some argue that Abilify in digital pill form might not be accepted well by people who (already) experience paranoid ideations and have persistent feelings they are being watched or persecuted. Suggesting to a person with symptoms of schizophrenia to swallow a pill that will send signals out of their body might worsen their condition. Therefore, doctor’s input will probably be very important to establish which people can potentially benefit from the new tracking pill and which may be harmed by it. Better Self-management or a Biomedical Big Brother? While digital pills can provide important information on medication adherence (as well as a person’s physical condition in some cases) several concerns have been raised regarding their use (e.g. ethics, privacy and data security). For instance, if digital drugs are suggested to people who do not have the capacity to understand all of the implications of data sharing, pushing this type of technology on them could be viewed as coercion. Another example of potentially dubious use would include insurance companies offering high incentives for pills with sensors, pressurizing some people to opt for digital medications that presumably will increase usage through compliance. It has also been suggested that in the future, digital pills could become a condition of parole. They could also become a condition of getting discharged from the hospital—one can imagine a world where you would need to agree to track your medication adherence before being discharged. Companies like Otsuka report no knowledge of such plans. However, it is hard to predict how this technology will be used in the future. Amelia Montgomery writes in the Vanderbilt Journal of Entertainment and Technology Law that it is not clear yet which privacy laws will apply to digital pills in the United States. Montgomery speculates that digital pills might not be subjected to the scrutiny of the Health Insurance Portability and Accountability Act (HIPAA) as it applies to other health information. It is becoming increasingly difficult to ensure data anonymization. Sensors, such as those designed by Proteus, can capture a lot of data about an individual, making it easier to profile a person in ways the individual might not understand. Fortunately, several safeguarding measures have been put into place to mitigate some of the ethical concerns regarding digital pills. For example, the pills are currently designed so the user has ultimate control regarding with whom his or her information gets shared. Furthermore, the user can withdraw consent at any point without consequence. Also, since digital pill technology relies on people wearing a patch (or a transmitter), as well as using a smartphone application, their participation depends on their willingness to use these additional tools. Nonetheless, some experts believe that the use of digital pills should be limited to specific situations, such as drug trials where it is important to ensure medications are taken by the participants to increase the validity of research. In fact, using digital pills could significantly reduce the costs of clinical trials, as well as improve their accuracy. It is expected that certain groups of people might be more open to using digital pills. For example, older people who have developed cognitive difficulties that might otherwise forget to take medication (or take it twice) unless assisted with this type of health technology. Others, however, argue that a balance needs to be struck between protecting privacy and overregulating the field of digital pills. Montgomery argues that the risks to users are low when compared to the convenience, cost reduction and health benefits that this new technology offers. As long as informed consent is stringently practiced when prescribing digital pills, a lot of the ethical concerns can be managed. If users of these new pills are given proper disclosure, as well as have the ability to ask questions, this empowers them to either accept or decline digital pills before purchasing them. On the other hand, this might add additional burden and time pressure on to physicians, so it may not necessarily be the most realistic solution. Can Digital Pills Really Increase Adherence? It has not yet been established if these drug-device systems will positively contribute to medication adherence. Ability MyCite also comes with a disclaimer that data gathering should not be used for emergency situations, as tracking might be delayed or not happen at all. 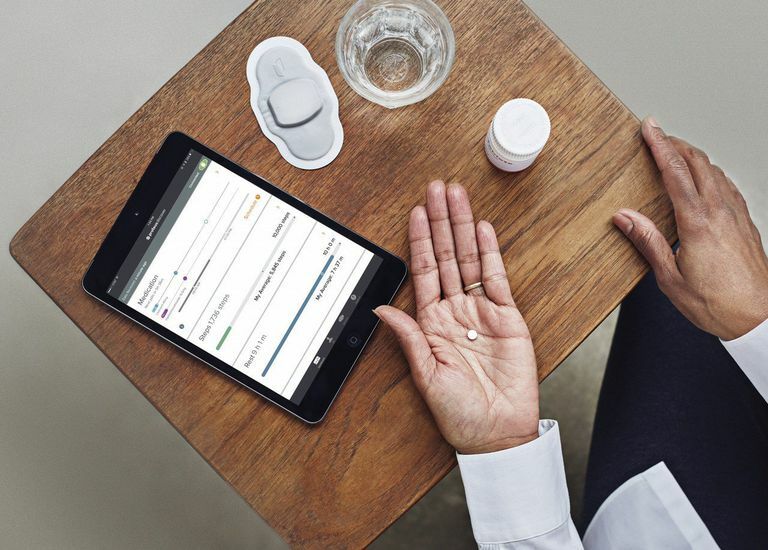 Experts on digital health, including Eric Topol of Scripps Translational Science, argue that it will take some time before this new health technology can impact adherence in a substantial way. People taking digital pills might, for example, refuse (or forget) to wear the accompanying patch that needs to be replaced every seven days to effectively collect signals from the swallowed pill. Initial studies of adherence have found that different tools, both high and low-tech, improve adherence. Research conducted by Proteus also showed that people taking sensor-enabled medicine for uncontrolled hypertension and type 2 diabetes achieved better results (and were more likely to reach their treatment goals) when compared to people taking standard therapies. This could possibly be attributed to improved medication adherence. At present, some people on Abilify who require this antipsychotic drug but do not comply with their prescribed drug regime receive Abilify as a monthly injection to prevent the re-occurrence of their symptoms. This indicates that we already have some rudimentary solutions for non-adherence. It is not clear, however, if people with compliance issues would prefer a digital pill to an injection. Moreover, in other fields of medicine, monthly injections are not a viable option. Therefore, sensor-enabled drugs may carry more merit in such cases. Assistant Professor Peter Chai, emergency physician at the Brigham and Women’s Hospital in Boston, used digital pill technology in a recent study to try to prevent opioid abuse—a pressing issue in the United States. Opioids are frequently prescribed on an as-needed basis for people with severe pain. The dose and frequency are often left to the discretion of the pain sufferer, which creates risks of overdose and abuse. Chai and his team found that digital pill systems could help monitor opioid ingestion in real-time. They suggested that interventions could be deployed as soon as abuse was detected, minimizing the risk of harm. People who participated in their study found digital pills acceptable and were willing to continue taking them. Chai’s study indicates that sensor-enabled pills have a broad scope of use, for example, with high-risk medication and groups of people who don’t have regular contact with health-care professionals. Patches (including the ones used with digital pills) already have the capacity to collect other biometric information, such as sleep patterns, vital signs, and body position. Using a patch for multiple sources of data, the digital health system can create a holistic picture of the person taking a specific drug—including side effects and patterns of ingestion. In this regard, these systems have the opportunity to revolutionize the way we get treated by medication. Brown MT, Bussell JK. Medication Adherence: WHO Cares? Mayo Clinic Proceedings. 2011;86(4):304-314. doi:10.4065/mcp.2010.0575. Buono E, Vrijens B, Bosworth H, Liu L, Zullig L, Granger B. Coming full circle in the measurement of medication adherence: opportunities and implications for health care. Patient Preference & Adherence. 2017;11:1009-1017. Chai P, Boyer E, Mayer K, et al. Digital pills to measure opioid ingestion patterns in emergency department patients with acute fracture pain: a pilot study. Journal of Medical Internet Research, 2017;19(1). Montgomery A. Just what the doctor ordered: protecting privacy without impeding development of digital pills. Vanderbilt Journal of Entertainment and Technology Law. 2016;(1):147-175. Mullard A. Do you want chips with that? Digital prescription pills, set to hit the market soon, offer the opportunity to address key drug adherence challenges in clinical practice and clinical trials. Nature Reviews Drug Discovery. 2015;(11):735-735.